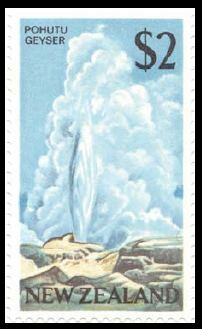 The United States issued this 5-cent stamp (Scott number 744) on 30 July 1934, showing Old Faithful. It was part of a set of ten showing views in different national parks. In 1935 the set was issued without perforations and without gum; the Yellowstone stamp in this set has Scott number 760. To commemorate the 100th anniversary of the first U.S. national park--Yellowstone--and recognize the national park system, eight stamps were issued in 1972. 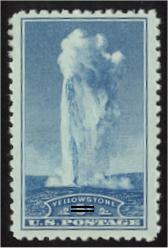 The 8-cent stamp showing Old Faithful (Scott number 1453) was issued 1 March 1972. On 17 May 2006 the U.S. issued a sheet of forty different stamps depicting American superlatives. One of these shows the largest geyser in the U.S., Steamboat Geyser, during a 1964 eruption (Scott number 4060). 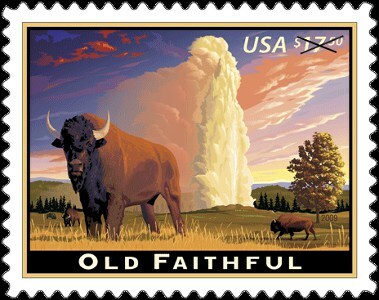 On 16 January 2009 the U.S. issued an Express Mail stamp showing Old Faithful (Scott number 4379). On 25 December 1966 the U.S.S.R. issued a set of seven stamps pertaining to Kamchatka and neighboring Soviet islands. 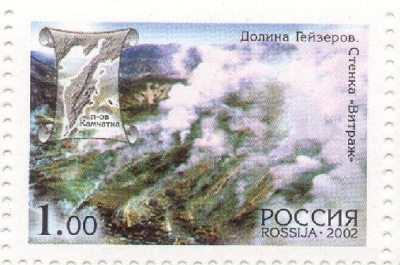 One stamp, Scott number 3284, depicts a geyser in Dolina Geizerov (Valley of the Geysers) in Kronotsky National Preserve. On 20 June 2002 Russia issued another stamp depicting Dolina Geizerov, this one with a 1 rouble denomination. 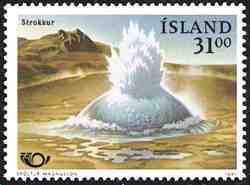 Iceland issued a series in 1938-1945 depicting two views of Geysir. Scott numbers (and issue dates) for these are: 203 (1938), 204 (1938), 205 (1938), 206 (1939), 207 (1940), 208 (1938), 208A (1943), 208B (1945). 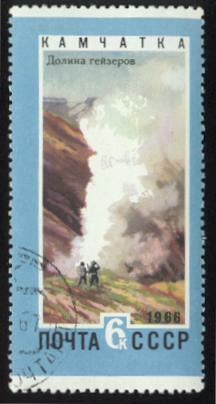 A pair of stamps issued 23 May 1991 included one (Scott 742) showing Strokkur geyser. 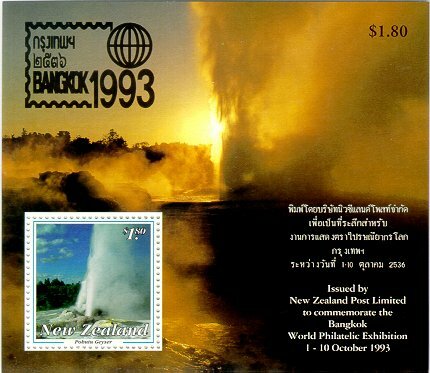 A set issued 14 March 1995 includes one stamp (Scott number 795) showing a stylized geyser. New Zealand issued a 1960-66 definitive series with a 1-pound value (Scott number 352) issued in 1960 showing Pohutu Geyser. 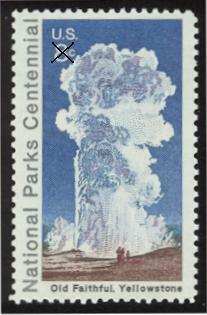 The same designs were used for a definitive series in 1967-70; Pohutu Geyser was show on the magenta $2 stamp issued in 1967 (Scott number 403) and the multicolored $2 stamp issued in 1968 (Scott number 404). 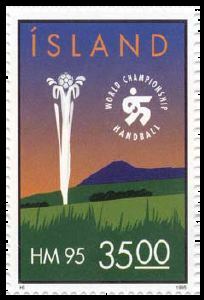 A six-stamp series issued 5 May 1993 depicted various geothermal features. 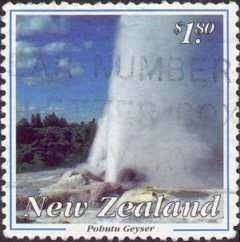 The $1.80-value stamp (Scott 1160) showed Pohutu Geyser and Prince of Wales Feathers Geyser. 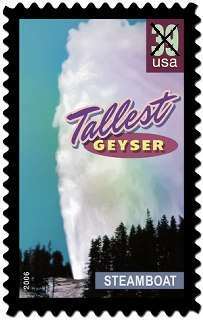 The preceding stamp was reissued as a souvenir sheet on 1 October 1993 (Scott 1160a) , showing an additional geyser view. 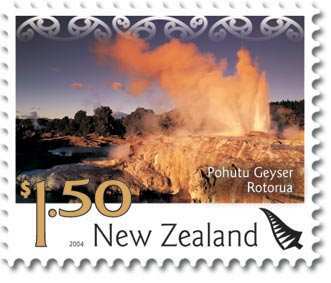 On 1 September 2004 a set of six stamps commemorating tourism was issued; one depicted Rotorua Geyser. On 24 October 2003 the UN issued six stamps commemorating World Heritage sites. The F.s. 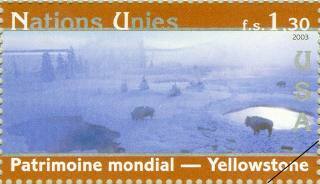 1.30 denomination shows a thermal area in Yellowstone in winter. (Iceland) "Strokkur" at Virtually Virtual Iceland. (New Zealand) Volcanism and Earthquakes/Bjørn Myhre. (New Zealand) New Zealand Post. 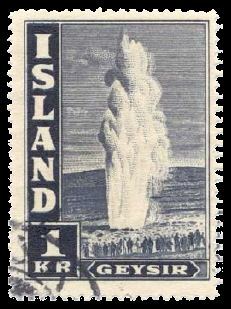 Late volcanic activity--Geysir and this detailed listing of stamps showing geysers--pages by Prof. Grubessi Odino. text © 2001-2006, 2010 by Wm. Robert Johnston. Last modified 11 May 2010.